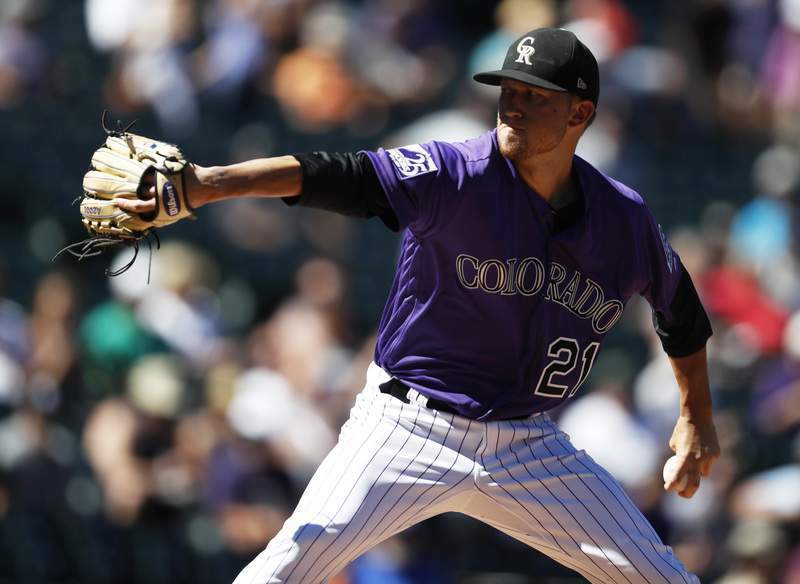 Associated Press Rockies starer Kyle Freeland worked into the seventh inning Thursday and had two hits to help Colorado beat Arizona. DENVER – Kyle Freeland got in on the fun at the plate, too, for the Colorado Rockies. Nolan Arenado and Trevor Story homered and David Dahl had three hits and two RBI to help Colorado take a 11/2-game lead over Los Angeles and a 41/2-game advantage over the third-place Diamondbacks. Los Angeles defeated St. Louis 9-7 at St. Louis. Freeland played two parts – keeping Arizona's offense in check until his left calf cramped up in the seventh and doing damage with his bat. He had an RBI double in the second inning and started a rally in the fourth with a bunt single down the third base line. Freeland (15-7) was just as effective on the mound. He gave up two through six innings and left with one out in the seventh after giving up two extra-base hits. A cramp that bothered him in the sixth inning flared up again, but he said he is fine.